I’ve got a piece up in today’s WaPo on some of the economic and social implications of the recent tanking in oil prices. Obviously, such prices jump around, and OPEC is talking about reigning in supplies, so the negative trend could reverse. But the points of my piece are a) low oil may be a boon for consumers at the pump, but it’s inconsistent with sustainable growth, and b) especially post-midterms, it’s time to start talking about taxing carbon. I suggest raising the gas tax as a good start, which, as I show, is more bipartisan than you thought. The piece also has a figure showing the impact of changes in energy prices on the growth of real wages of middle-wage workers. I point out that the correlation between those two variables is much higher now than in the past. The “energy effect” in the figure is simply the difference between real wage trends with and without energy costs. The first figure below shows wages deflated both ways. The blue line is real hourly wages (production, non-supervisory workers), yr/yr, and the green line is wages deflated by the CPI without energy costs. 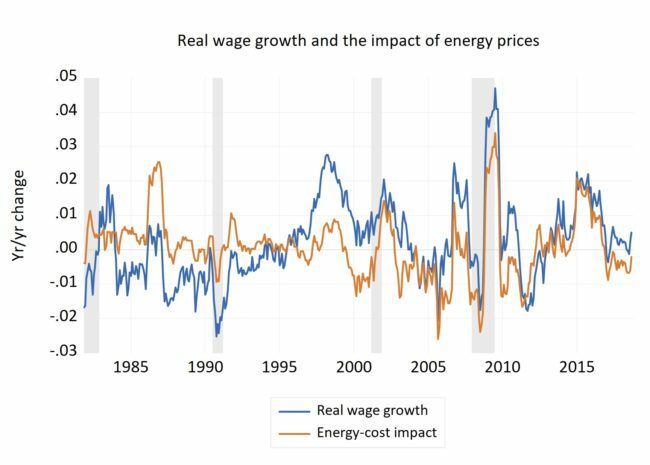 Therefore, when the two lines are broadly coincident, as in the earlier decades, it implies changing energy costs weren’t much of a factor in real wage growth outcomes. 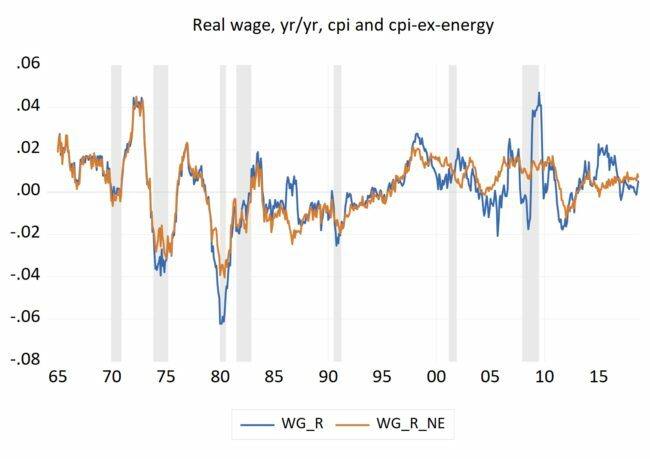 The second figure shows the same CPI-deflated real wage trend but plotted against the difference between the two series in figure one, the idea being that wg/cpi – wg/cpi_no_energy nets out the energy impact. Share the post "Energy prices and real wage trends"
One comment in reply to "Energy prices and real wage trends"